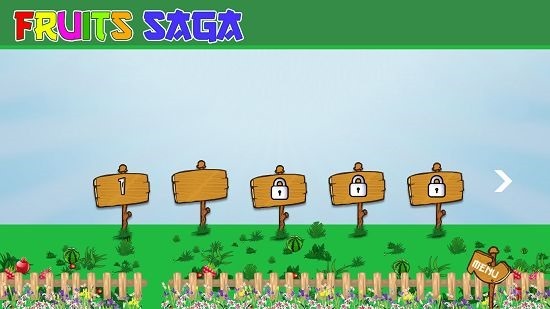 Happy Garden is a free puzzle game for Windows 8 and 8.1. 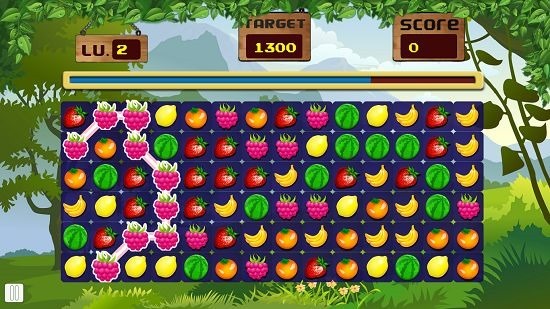 In the game, you need to group together similar fruits which will award you points. In the game, each level is of a limited time frame, and you have to achieve a goal score to succeed in the level. By all means, you can make more than the goal score if you hit it way before the timer ends. But if by the time the timer ends, you aren’t able to hit the goal, it’s game over for you. The game has a neat interface with easy controls that only requires you to click and drag your mouse over fruits to group them together. Only similar fruits can be grouped together – for example apples can be grouped only with apples and bananas only with bananas. Happy Garden is available for free from the Windows App Store. When you install and run the game on your device, you will be presented with an interface wherein you can simply click on the Play button to select the level from the level selection screen which looks like the screenshot shown below. In the level selection screen, initially only the first level will be unlocked. As you progress through the game, more and more levels get unlocked. You can then click on the desired level that you wish to play in the level selection screen and the same will be opened up in the gameplay screen of the app. The gameplay screen resembles the screenshot below. You can see me in the process of making a combo. You can see that you can click and drag your mouse around on the fruits of the same type as long as fruits get grouped together inside one drag. 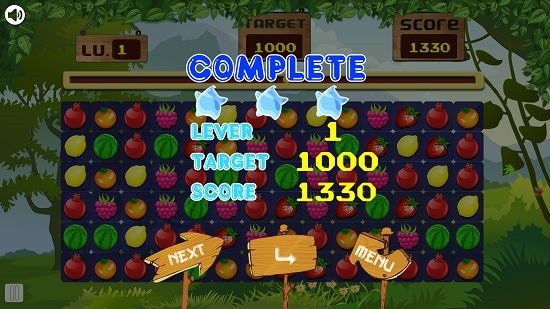 Once you release your mouse, the combo will be created and you will be awarded the points at the top right screen corner. You can see your goal score at the top center, and the constantly depleting blue bar at the top of the puzzle is your timer. You have to hit your goal before the timer runs out. If you happen to complete the level successfully, you will be presented with the popup as shown below. You can then choose to proceed to the next level, restart the same level or go back to the game’s main menu. This sums up the game’s features. Happy Garden is a well designed puzzle game to test your wits. The game makes you think hard about the combo with the maximum fruits involved, and you really get a sense of accomplishment when you are able to successfully form such a combo. The app is light on its size, so you don’t have to worry about long waits for being downloaded on slow internet connections as well!